(Post revised 7/12/2012 in response to comments.) In my last post I showed blends of unfired Pardo Clay primaries. (If you haven’t read the previous post I suggest you read it before trying to understand this one. ) I told you I would fire the clay later to check for color shifts and report on the results in the next post. Here are the results. 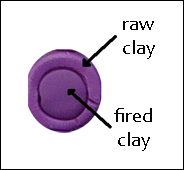 How I did the test: I punched small “buttons” of clay out of the unfired disks of clay and fired them according to the package directions. After they had cooled I replaced them in their original positions so that each fired center is surrounded by raw clay. I thought you would be able to tell from the picture that very little color shifting occurred, but from the comments I’ve gotten here and on my Facebook page I’ve concluded I should describe what I see first hand. A slight amount of darkening occurred but the amount is well within the range of what is acceptable to me. The buttons have a lovely matte finish while the outer, raw clay is shiny (therefore it reflects more light which might make it look a little brighter in the picture). I can see I’m not through with this test. I’m going to have to sand and buff the buttons and put them back for another photograph. Another thing I might do is add a bit (1/12 part or so) white to each color and do the comparison over again. Adding a a small amount of white to most polymer clay colors makes them look a little brighter after firing, but that’s for another day. Can you tell I’m a scientist by training? Sure looks like the Pardo color dulls and darkens after it is cured. How disappointing! Which brand do you feel is the most colorfast? In watercolor we have fugitive colors so any color we mix with them will change over time as well. I wonder how these colors do over time. Thanks for taking the time to do all this work! Beth, Your comment led me to revise this post. I think part of the difference you see is the result of comparing raw clay that has a shiny surface to fired clay that has a matte surface. Yes, we can tell you’re a scientist through and through. And thank you for sharing your results. You are welcome. Since I’m doing the experiments for myself I figured I might as well put the results “out there” so others can draw their own conclusions. Hey Carol, I’ve not tried pardo clay but those colours look pretty yummo to me. I can’t seem to tell a huge difference between raw and baked. What a great thing you’ve done for all pardo users. Yes they are and you are welcome. I know Lisa P quit sponsoring pardo but I can’t remember why. I know it is a strong clay and you can bent it and even tie it into a bow without any problem. I do not see a big change in the color. I recently bought quite a bit when it was on sale for a great price. I have yet to try it and I don’t think I will make beads with it and maybe not any jewelry at all. My initial plan was to make tile for my fireplace but the edge of the insert gets to hot so not sure what to do. Thanks for all the testing you are doing. Looking forward to hear how well it sands and shines up. You might also try firing at the top temperature (not advised by Viva Decor but produces the greatest transparency of all clays) which is 315 degrees, this can produce very good faux glass with trans Pardo Clay but it would be interesting to know how much darker the coloured clays go at this temp so that if you wanted something in faux glass but also with coloured clay – we could see what difference this higher temp makes to the colour darkening. Thanks for the suggestion, Fran. 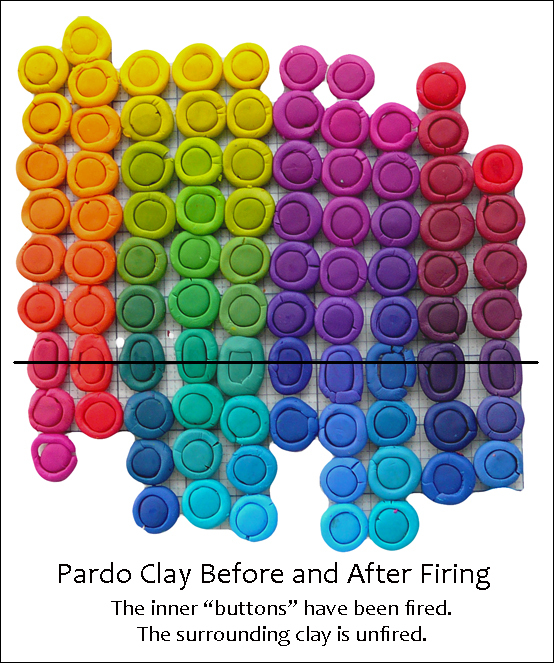 Love what you are doing with Pardo clay and this test is terrific! Especially coming up with the idea of cutting “buttons” to fire and then replacing them to show the (very slight, if any) difference. Thanks for revising your post to explain the slight color difference do to light reflection. I am commenting because I had to ask: What kind of scientific training have you had? It comes through loud and clear, from the title on down. Really a great read. Hi Carol, did you get round to sanding and buffing yet? I would be intertested to see the results of that too. I stopped working with Pardo shortly after this post.